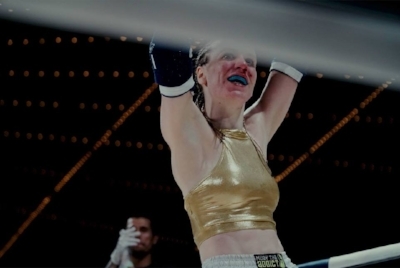 If you were to ask the Irish Grace Aveen what was her biggest accomplishment this year, she’d tell you it was when she stepped into the ring at the world’s biggest stage to fight on Triumph Kombat’s Full Rules Muay Thai bout. While the fight did not go her way, it was an experience that she was beyond grateful for. To an outsider, the tall, fit, lean, blonde-haired and blue-eyed beauty must have it all. However, Aveen has had a journey that was anything but simple. “I suffered severely from depression and alcoholism,” she states, almost as if saying she had the flu or broke her leg. Grace’s infectious and bubbly personality shines through even as she reflects on her darkest times. The athlete moved to New York City from Ireland five years ago and in her early months of adjusting to America, she made sure to party hard and to party often. By chance of an online coupon to a martial arts academy, Aveen found the sport that would change her life. Four and a half years later, the fighter has completely transformed herself. No longer drinking or smoking, she is now a personal trainer that coaches both adults and children. In the last year alone, she has fought a whopping seven times, holding a record of 4-3. Now fighting under Evolution Muay Thai, which has produced such fighters such as UFC strawweight Angela Hill, Aveen strives to rebuild herself and be the best version of herself. While the road has been rocky and sometimes inconsistent, she’s eager to build a new start. More than just about improving her record, the athlete looks to fight the stigma of depression and suicide. Coming from the lifestyle that she had before, where she was always squabbling with friends and often was hospitalized for alcohol-related illnesses, Grace finds herself to be a whole new person. The meaning of the word Grace has many definitions, but is often taken to mean having an elegant poise or demeanor, being courteous, and receiving salvation from the universe. In Grace Aveen, no name would ever suit her better. Friendly and humble, extraordinarily enthusiastic, and a champion for all people’s success (including her opponents), she has exemplified the power of one’s determination to live a better life. Every time she puts on the gloves, she only focuses on her gratitude.